It is with great feeling that we say: On October 25, 2017 Dorothy Koppelman—artist, Aesthetic Realism consultant, founding director of the Terrain Gallery, and one of the most important women in cultural history—died at the age of 97. We thank her profoundly and with love, as will people everywhere in all the years to come. As she studied Aesthetic Realism, her work as a painter became among the finest produced in America in the 20th century. We greatly treasure her straightforward, down-to-earth, subtle, deep, kind seeing—as a consultant, a teacher of the Critical Inquiry class for artists, and an invaluable, irreplaceable friend and colleague. It is our intention that the vision impelling her life—a world made kinder, more just, and beautiful through the study of Aesthetic Realism—become a reality. 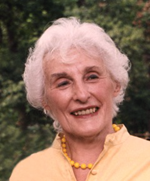 Dorothy Koppelman enabled thousands of lives to become better, happier, more honest and expressed, including our own. Her beautiful effect goes on.